I don't think I ever posted Letterbox Man parts I and II. 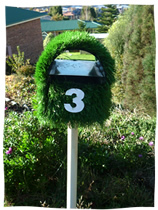 Part 0 was the unadorned grassy letterbox (left). Part I was Letterbox Man pushing a lawnmower, Part II was the lawnmower upside down with the Letterbox Man surrounded by tools trying to fix it. And now, part III - Letterbox Man wearing a novelty apron, standing at the BBQ. I actually had to sew bits of the apron so I hope the postman appreciates my extra effort.